Millions of users worldwide use Microsoft Outlook on daily basis in order to send/receive emails, manage events, store contacts, etc. Outlook, which is a part of Microsoft Office suite ships with tons of features which make it a reliable email service for students, businessmen, lawyers, and general users. Here, we will not get into much details about Outlook but focus on its ability to manage your emails. MS Outlook supports custom templates which make your work easier and save you a lot of time. You can even share templates with others as it lets you save them as shareable OFT files. If you compose the same kind of emails again and again, then email templates will definitely come in handy to save your time and effort. In any email service or client, email templates play an important role. With the email templates, you can quickly compose a message and send it to the desired recipient. All the Office products, including Outlook, support add-ins or plugins so that the functionality of the product can be extended further. For Outlook also, you can add some email templates plugin available on Microsoft Store to send emails quickly. Or else, the best thing is you can save a composed mail as a template itself. All the templates that you create manually or import from a plugin can also be exported easily. This is helpful in case you have multiple computers on which you use Outlook. You can export templates as OFT file on your PC which can be opened in Outlook again in one click. Using custom templates in Outlook is actually very simple. Once you are on the compose email window, you can save currently composed email as a template to use it later. Just use File > Save As option and save it as OFT file. When you later want to use it again, then import it from the main screen via New Items > More Items > Choose Form… > User Templates. This will import any previously saved template in the message box. You just modify it and then send it to the desired recipient. Although there are options to save and import standard templates, user templates are good option as you can create them the way you want. For more advanced template usage, you can add HTML templates in your emails. There are some online services which provide you custom and preset templates. The HTML templates can be added if you have an HTML file with you. From the compose email window, use the paperclip icon, select HTML, and use Insert as Text option. The template will be added to the current email message which you can customize and send the email to the recipient and also save it for later use. 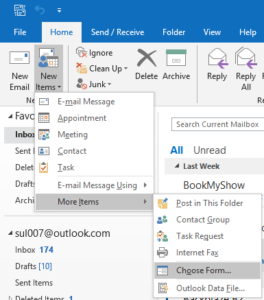 In brief, Outlook makes is very simple to play around with email templates no matter if they are in text or HTML form. 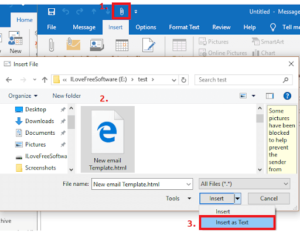 For composing heavy and light emails, templates can help you a lot and you can either import them, create them, or use an external plugin to add support for most common type of templates in Microsoft Outlook. If you want a plugin for templates, then I will suggest you use “Template Phrases”. It is free and comes with tons of simple and professional email templates that you can include in your daily emails in just a click. Otherwise, you can create a custom template by yourself and use it.